The growth of our civilization is changing the ocean in ways that are deadly for corals. If we don’t act soon, it may be too late. We live a big life on a small planet. The human population has grown from 5 to over 7 billion in one generation, and consumption has escalated too. Building homes, factories, and roads often leads to a better quality of life but it’s also increased pollution dumped into the air and water. Greenhouse gases like carbon dioxide have raised the global temperature. Our collective impact is so large it is even dramatically changing the chemistry of the ocean. Activities such as burning fossil fuels release carbon dioxide, or CO2, into the air, but a large part is absorbed by the ocean. CO2 in the water causes the ocean to become more acidic, and a more acidic ocean means it’s harder for creatures-- like reef-building corals and shellfish-- to create and maintain their calcium carbonate skeletons and shells. And that weakens them. Locally, trash, boats anchoring on the reef, destructive fishing practices, and the wrong sunscreen worn by swimmers can also sicken corals. These local issues compound the global threat of a warming and acidifying ocean. The world’s largest reef, the Great Barrier Reef of Australia, can be seen from space. It is home to more than fifteen hundred species of fish and estimated to be five hundred thousand years old -- one of the wonders of the natural world. But in 2016, most of the Great Barrier Reef’s corals bleached, and almost 25% died from an astonishingly long period of intensely high water temperatures driven by global warming. None of the central and northern sections of the reef were spared from the heat stress that causes bleaching. The northern third was hit the hardest, and two thirds of its corals died. And tragically, mass die-offs are again happening on the Reef for an unprecedented second year in a row in 2017. Even worse, it was not an isolated incident. All of the world’s corals are in danger. We have lost, already, approximately 50 percent of the world's reefs. This has occurred really, within the last three decades. So fast, when we're talking about an organism that has been on the planet, and been in symbiosis with its microalgae, for over 50 million years. And the incidence of bleaching is increasing in frequency and intensity as the planet warms. It’s not every year that water temperatures stay high enough, long enough, for corals to bleach. In fact, extreme high temperatures used to come in cycles, often driven by climate events like El Niño. Due to climate change, the higher temperatures are becoming more frequent, more intense, and more widespread, The underwater heatwaves that have devastated the corals on the Great Barrier Reef are part of the third global coral bleaching event. This one has now lasted 3 years - by far the longest, most widespread, and most damaging yet - and it continues even now. It’s feared that corals could now face bleaching so often that whole reefs and even species will be lost forever. 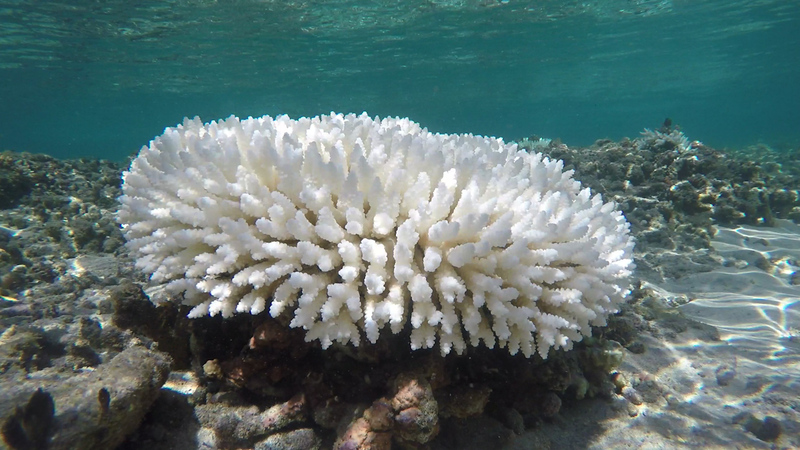 NOAA’s Coral Reef Watch program, and others, use satellites to monitor the heat stress that can cause coral bleaching and uses climate models to predict where bleaching may occur on the world’s tropical coral reefs in the next few months. But what can we do to reduce the risks? Can corals make a comeback? Watch our next video in this series to find out.